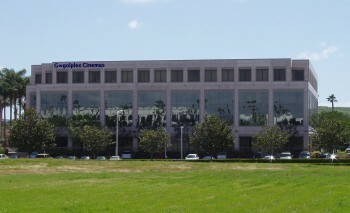 Googolplex Theaters was founded in Milwaukee, Wisconsin in 1994 by visionary cinema mogul Bob Googol. Recognizing the trend toward placing ever-more screens under one roof, he conceived of a theater where the number of screens was limited only by the number of patrons. Googolplex experimented with on-demand scheduling of showtimes, testing business models in three small theaters—one in downtown Milwaukee, others in nearby suburbs. Eventually it became clear that virtual reality technology was the best way to achieve his vision, and Googolplex entered into a strategic partnership with VR.5 Labs, headed by virtual reality pioneer Sydney Bloom. By 2001, the technology was ready for individual screens, and the three Googolplex locations expanded to 10 throughout Wisconsin. Today, the Googolplex chain stretches across the nation, with over 200 theaters...and literally millions of screens. Googolplex is a privately-owned corporation based in Nevada. ©2005-2007 KTV. Not sure about something? Check our FAQ!